If I ever start thinking my dogs are people, all I need to do is dish up some tripe to be reminded that, oh yeah, dogs are definitely a different species! The smell and look of tripe is repugnant to most people, but it’s glee-inducing to every dog I’ve ever met. Not only do dogs love it, it is also very good for them. 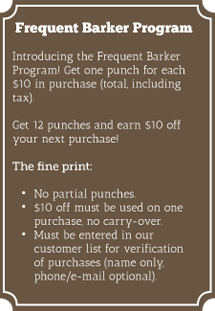 This month I’m here to educate you, and entice you to feed your dog some tripe. 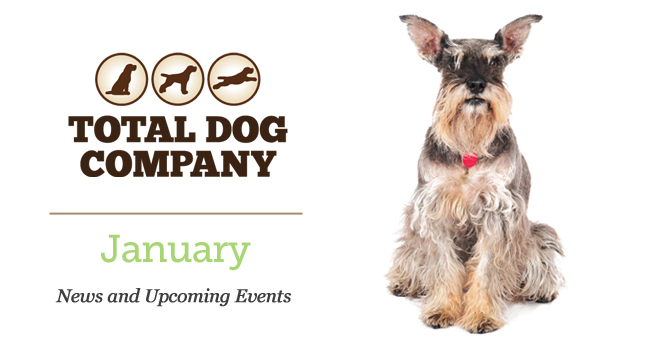 Take this opportunity to let your dog try some tripe this month! 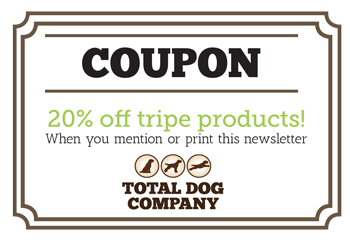 Mention or show this newsletter at the register and receive 20% off any tripe product we have (coupon good through January 31st). The beneficial form of tripe is called “green” tripe. It is the stomach of a ruminant animal (cow, deer, buffalo, sheep) that has not been processed or bleached (other than basic cleaning). This is NOT the bleached tripe that is sold as people food (although why any human being would eat it is a mystery to me). There is one downside of tripe: in its raw form, it’s stinky! But, keeping it cold reduces the odor that we have to withstand. Plus, the speed with which the dog consumes it means it’s not sitting around for us to smell for long! In a freeze-dried form, it isn’t that bad. Some people feed their dogs green tripe almost exclusively. 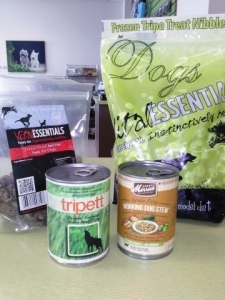 I use it as a sort of supplement—add it to a meal a couple times a week—plus I use the freeze-dried form as a high-value treat (if I want to get my dogs to do the nearly-impossible, I offer freeze-dried tripe nuggets as the payoff). There’s no prescribed amount to feed, and your dog can’t overdose on it. It has calories just like anything else, so be aware that when you add tripe, you should decrease some other ingredient in your dog’s diet. We carry canned tripe as well as frozen raw and freeze-dried tripe.